From mental health to animal welfare, the Internet has chimed in with a range of explanations for Pokémon Go’s existence. If you’re not yet sick of millennials, parents, the internet and the elderly all talking about Pokémon Go, it’s about to get a whole lot better. In case you’ve been hiding in Zubat’s cave, Pokémon Go is an augmented reality game that anyone can download as a smartphone app. Instead of battling other Pokémon in the game, players venture out into the real world. Using a combination of GPS and camera view, the game recognises your surroundings to enable anything from a Squirtle sitting on a local restaurant table to a dragon egg rolling down a hill. Levelling up and scoring points rests on how much time a player is willing to spend outdoors, exploring new neighbourhoods and walking kilometres at a time. The good old days of sitting on a couch and staring at a laptop screen just don’t cut it anymore. Such innovation and widespread uptake raises questions — and, as always, the Internet has answered. Here are our favourite conspiracies about Pokémon Go. 1. It’s all a huge ploy to combat obesity and encourage healthy humans. Have you heard about Pokémon eggs? They have to be walked at least 2 kilometres to be hatched. That’s right. You want it? Walk for it. Pokémon Go eggs can give players very rare Pokémon — but they have to be walked several kilometres to hatch. Pokémon Go has effectively brought ‘I’m going for a walk’ back to the vocabularies of hundreds of thousands of millennials alike. And, they’re often doing it in groups, taking catch-ups with friends away from the bar and towards the gardens and walkways. The game offers all the appeal of a 3D-graphic, phone-tapping, staring-at-screen activity harnessing technological advancement — but without the usual sit-down mandate. We’re hoping the outdoor activity and movement thing will become enough of a cultural shift before augmented reality really catches on and kids realise they’re doing exactly what their parents wanted. 2. It’s really designed for mental wellbeing. For many suffering from depression and anxiety, motivation can be extremely difficult — particularly when getting out and about means interacting with other people. The often isolated nature of gaming makes it a magnet for communities seeking self-help. But it’s not necessarily helpful. Honestly, Pokemon Go is helping me with my depression. It gives me a reason to get out of my house and get exercise. Am I ashamed? Hell no. 3. It’s actually the beginnings of a global citizens’ campaign for public internet. Or, it’s all just a big ploy by mobile data companies. In Australia, if there’s one group profiting from the joys and misfortunes of enthusiastic Pokémon trainers everywhere, it’s mobile data providers. There are few, if any, Pokémon within the range of your WiFi modem. To succeed, players have to venture out into the big bad world of limited WiFi connectivity and expensive mobile data. The game drains packets upon packets of data to be able to integrate a constant camera view and multi-layered graphics with the necessity of being outdoors away from your WiFi connection. Free WiFi initiatives are great — but when that’s not possible, it’s mobile data that gets eaten. Instead of keeping the reigns in the hands of these mobile companies, we’re instead hypothesising that excessive use of mobile data packets could result in an epic citizens’ revolt for public internet services for humanity. Come on, team — a little positive reinforcement backed by history never hurt anyone. Especially when the outcome benefits not only Pokémon trainers, but has wider impacts for economic opportunity, access to education, humanitarian response and big data. 4. Niantec decided to teach unknowing Americans the metric system. There’s something about a system that just makes sense — and Gizmodo published a fantastic post on poor Americans who are suddenly being forced to learn a globally-recognised, science-based, accessible system all because of the evil Pokémon Go. That’s right — Americans must use the metric system to establish distances, locations and more. Some of Pokémon’s rare eggs need to be walked 5 kilometres to hatch. Other than exercise, that’s also cause for calculation for budding young trainers in America who then have to work out how many miles are in 5 kilometres. Pokémon has even prevented changing the game’s units. Sneaky. 5. It’s a huge effort to encourage and support small business. A ‘lure’ is something anyone can place on a PokeStop to draw Pokémon — and other keen Pokémon trainers — to it. With in-app purchases enabled, anyone can purchase a lure for something like $1.19 for an hour of people on smartphones huddled around. 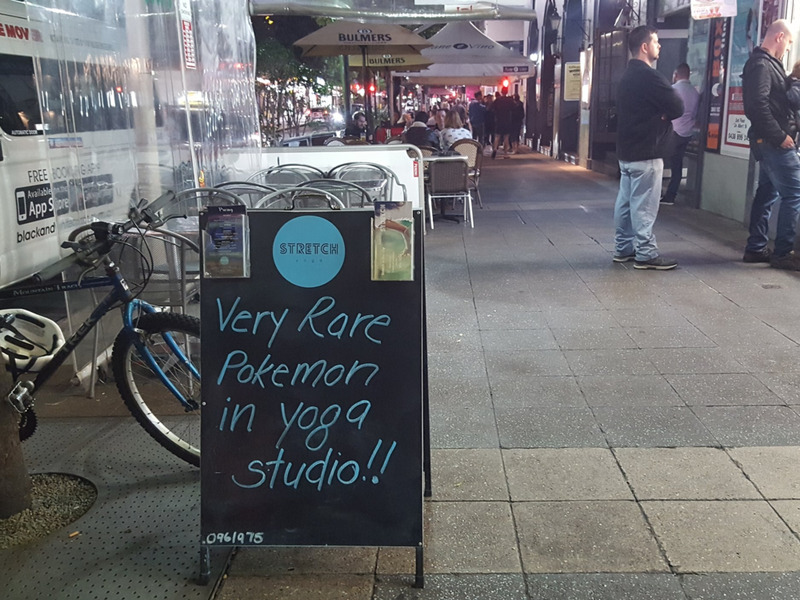 South Bank small businesses are taking advantage of Pokémon Go, using ‘lures’ — indicated by the pink confetti — to draw people to their stores, stalls, studios and cafes. Needless to say, this is a goldmine for small business. Businesses are purchasing these lure modules to draw customers in and around their service — and it’s working. 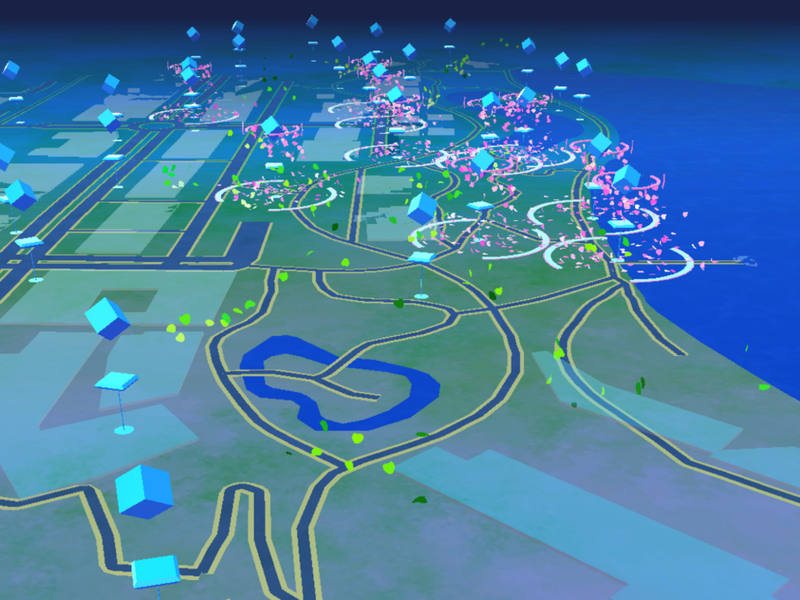 Last week, this writer tried to cycle through Brisbane’s South Bank, where more than 20 lures were active within a 5-kilometre radius and hundreds of people were crowded around bars, restaurants and market stalls to try and catch Pokémon. 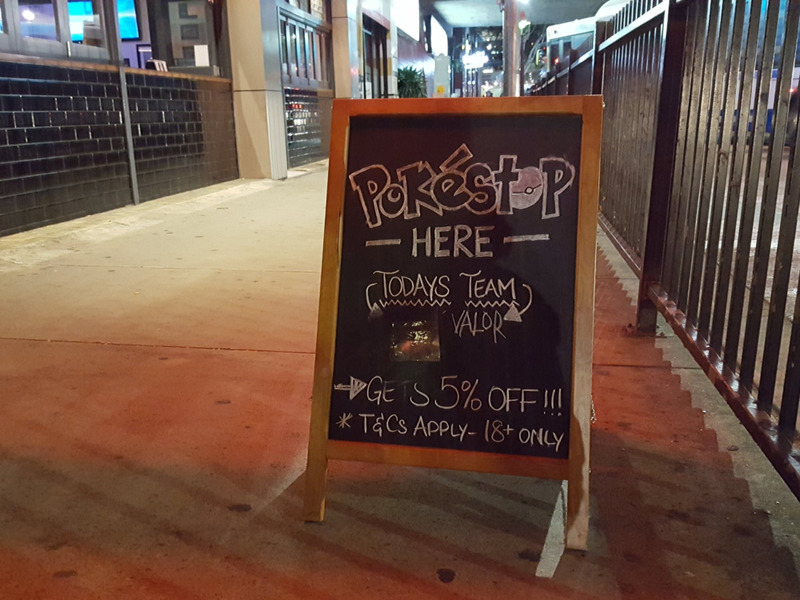 The Fox Hotel took advantage of this, advertising a PokeStop right at their door and offering discounts each week to a different Pokémon team (note for non-players: each player selects one of three teams through which to battle other Pokémon), while other businesses like Stretch Yoga offer a slightly more tongue-in-cheek approach to making the most of Pokémon Go. Either way, it’s a win for the little guys. 6. It’s really all about saving the animals. With masses of people suddenly finding their feet and walking kilometres at a time, cities are being explored like it’s 1899. Because Pokémon Go encourages venturing into new areas and going where the Pokémon are, animals are being found and rescued in areas that previously saw much fewer people. If it weren’t for Pokémon Go, for example, these hamsters and mice abandoned in the heat may not have been found in time. What’s more, an Indiana animal shelter recently realised they could make the most of this sudden boost in walking. It has now enlisted the help of Pokémon Go players to walk its dogs after callouts were shared thousands of times and people decided they may as well bring a canine friend along on their quests. We can’t think of a more perfect match. The game has its flaws — and the risks are real. This article in The Onion entitled ‘What Is Pokémon Go?’ answers this question pretty well. But there’s no doubt that a sudden boost in exercise, mental health benefits, cases for public internet, scientific education, small business growth and animal welfare as a result of a measly app are a call for more than just Jigglypuff dancing around. It shows us we’re on track towards a more connected world where technology can enable much wider benefits than we often give it credit for. More of these wins are out there — we’ve just gotta catch ’em all.